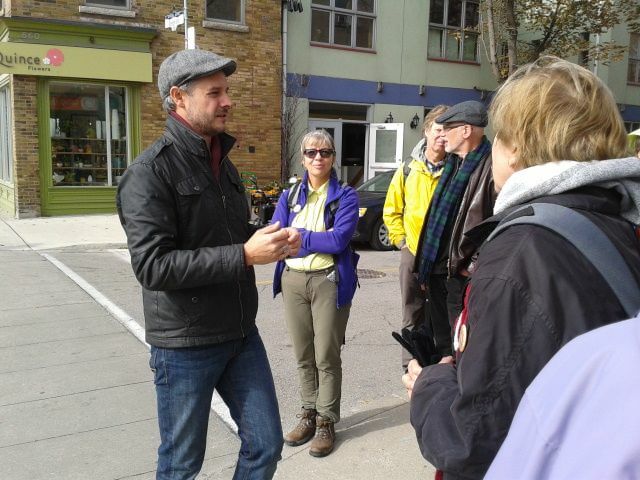 Yesterday urban planners Asher Mercer (Urban ID Consulting) and Edward Nixon (EN Consulting Group) hosted a walk along Queen Street as part of their project, The People’s Queen Street, which is attempting to reimagine the major east-west corridor as a public space prioritizing people. 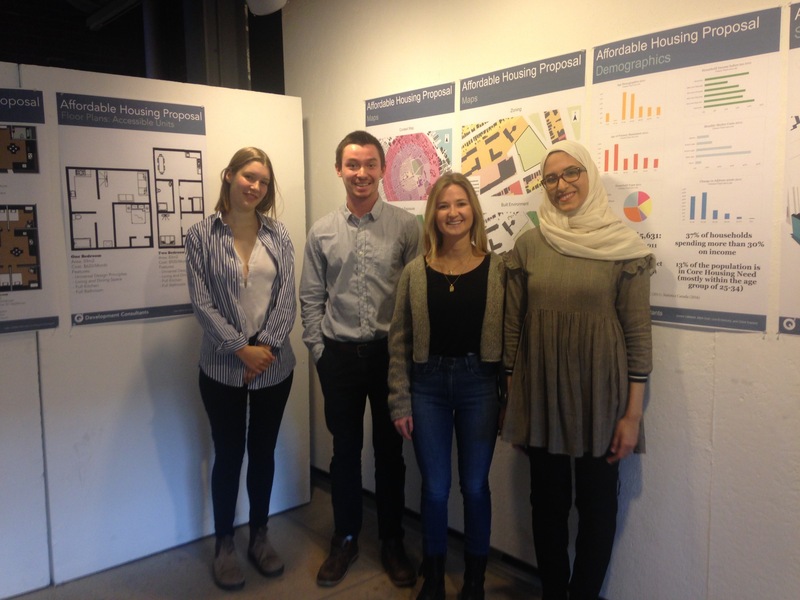 Partnering with the Toronto Community Foundation, Evergreen Foundation, the Centre for Social Innovation, and 100 in One Day Toronto, Urban ID Consulting and ED Consulting Group are organizing several events from summer 2014 until spring 2015 to help people experience the street in new ways and think about ways in which it could be redesigned as a better space for pedestrians. 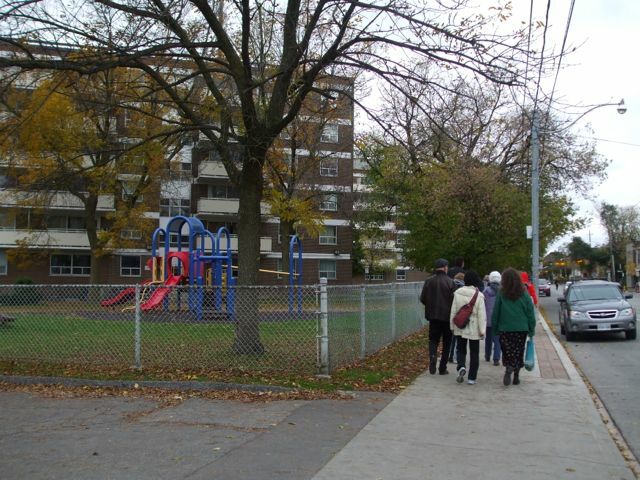 Yesterday’s walk began at Neville Park, where the 501 Queen streetcar begins (Neville Loop) and continued all the way to Queen and Roncesvalles. 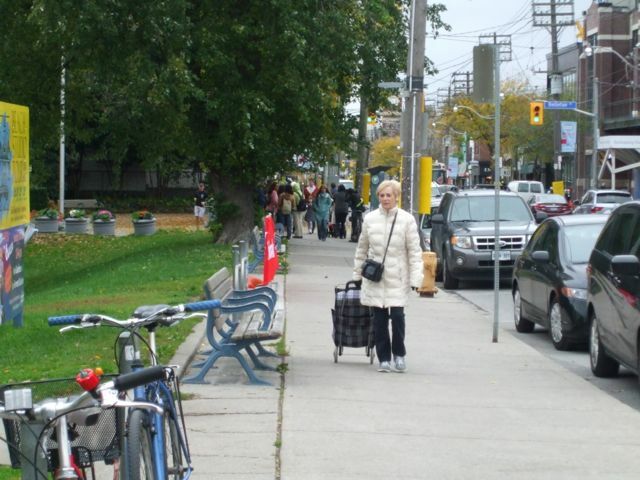 Joined by intrepid walkers from Toronto Trails and Ontario Walks, a group of about 35 walkers crossed the city, stopping to think about development opportunities at Queen and Broadview, view historic Ashbridge House and Campbell House, and finish the day at Beaty Boulevard Parkette. The walk is about 17km in total, but I focus here on the first 5.7 km east of Broadview. 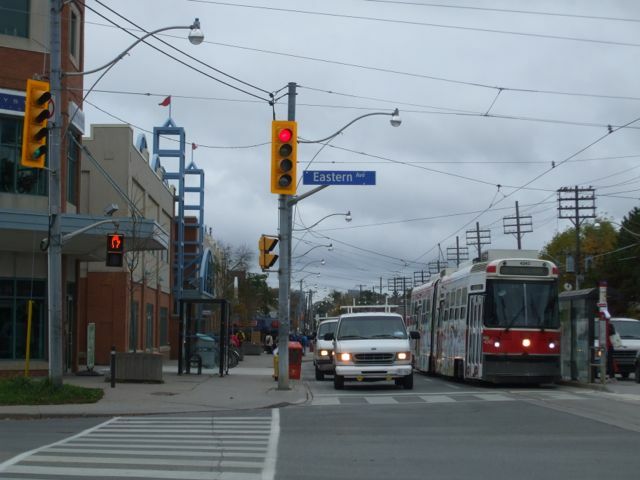 Neville Loop is a small unimposing turnaround for the streetcar (albeit with quite a long history as the City of Toronto’s easternmost streetcar loop) across from the Art Deco-styled R.C. Harris Water Treatment Plant, which writer Derek Flack characterized as “one of Toronto’s most beautiful and mysterious buildings.” For our purposes, the westernmost corner of Neville Park provided a natural meeting place and amphitheater for Asher and Edward to introduce the purpose of the walk today and invite participants to submit their comments, tweets, and photos to the project website. 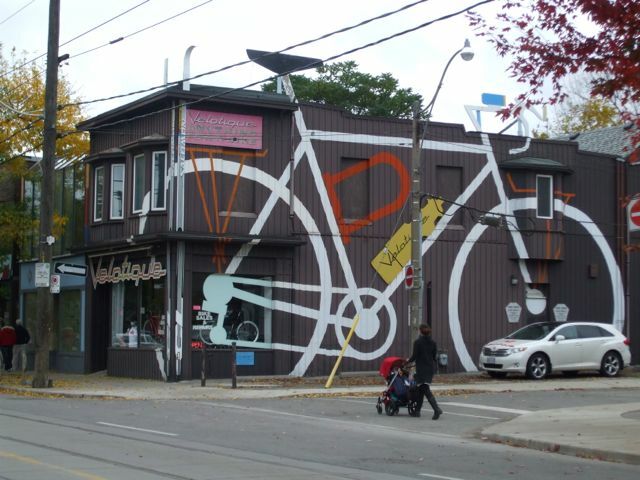 We began at a brisk pace on Queen, taking in some of the built form that spoke of an earlier main street. 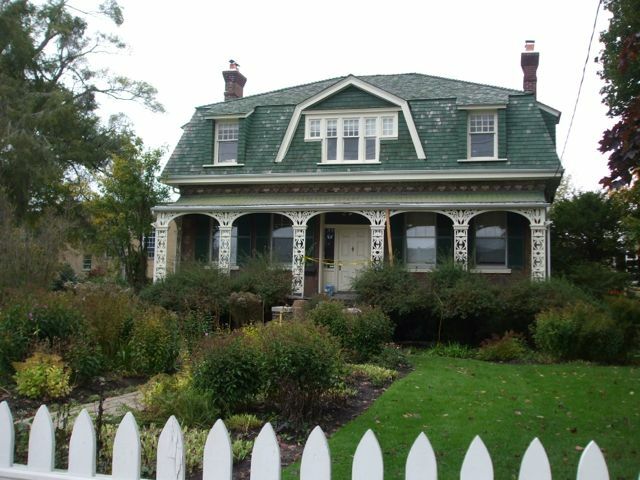 On the way, we passed a number of historic buildings, like Black’s Veterinary Hospital (founded in 1911) and the Ashbridge Estate, which are well known: Toronto’s Ashbridge’s Bay was named for Sarah Ashbridge, in recognition of her position in one of the city’s founding families. 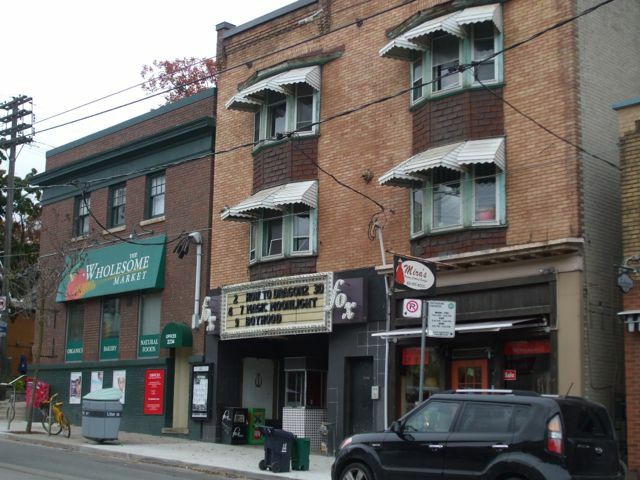 Other lesser-known marvels included the tiny Fox Theatre (opened in 1914) and the Beaches Library (whose original structure was a Carnegie library). Queen Street East has that intrinsically interesting pedestrian atmosphere of the early 1900s, with the recurring main street urban form of a two-storey brick structure with apartments over the shops, punctuated by unfortunate modernist intrusions, as I’ve shown in the photos below. You can tell the street was gradually widened, giving even the most charming main street areas very narrow sidewalks. 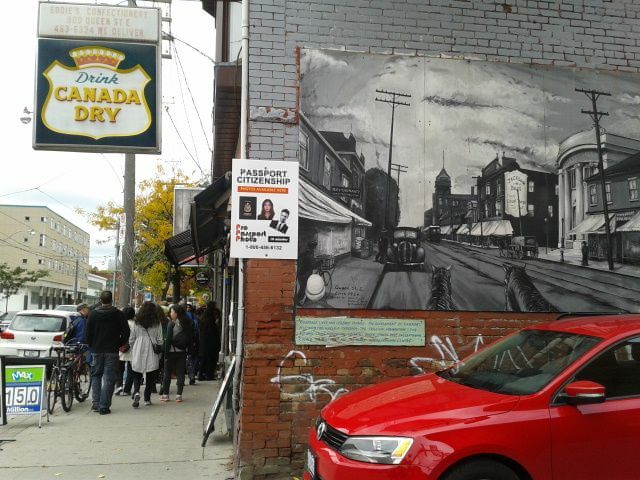 It’s also impossible to ignore the hipster influence on the street, as the traditional dry cleaners and butchers of The Beach give way to coffee shops and restaurants in the popular neighbourhoods of Corktown, Riverside, and Leslieville. The urban redevelopment of the New Broadview Hotel and the Riverside Square project (check out streetcar.ca for more details) will continue this character shift towards upscale urban living. 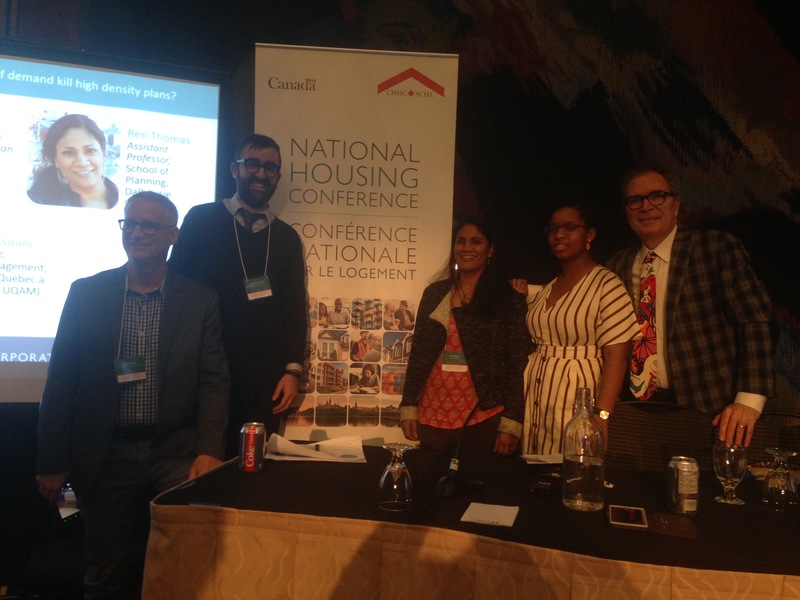 Displacement of the current residents is seen as a necessity: Streetcar Developments has been working with the City of Toronto and Woodgreen Community Services to assist transition of the existing residents to other community housing. 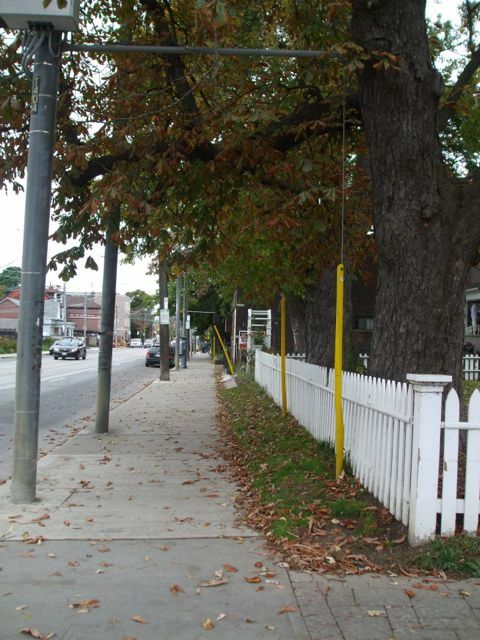 Aaron Knight from Streetcar met us to explain some of the changes that will happen near this historic intersection, particularly the south side of the street meeting Munro, which will be reinvisioned as a pedestrian and urban space open to the public. 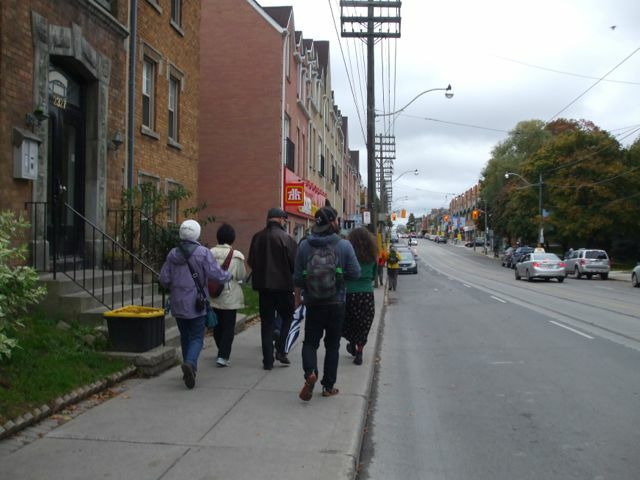 From Queen and Broadview, the group continued west on to Campbell House, and finished up at Queen and Roncesvalles. 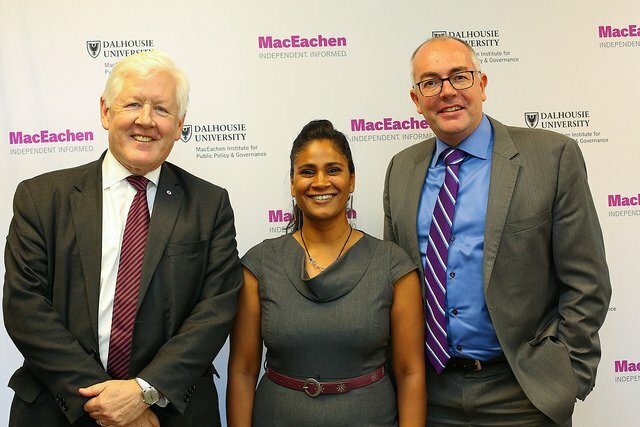 If you have any thoughts on Queen Street, and how to improve its public realm and pedestrian amenities, share them with Asher and Edward at peoplesqueenstreet.org/queenstsurvey, on their Facebook group, or on twitter. Squeezed for space at Eastern Ave.–it’s difficult to get around the bus shelter. 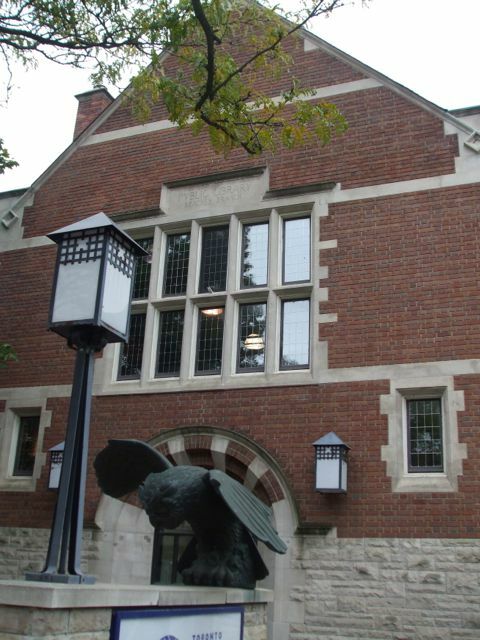 Why not just ask building owners to construct an overhang? 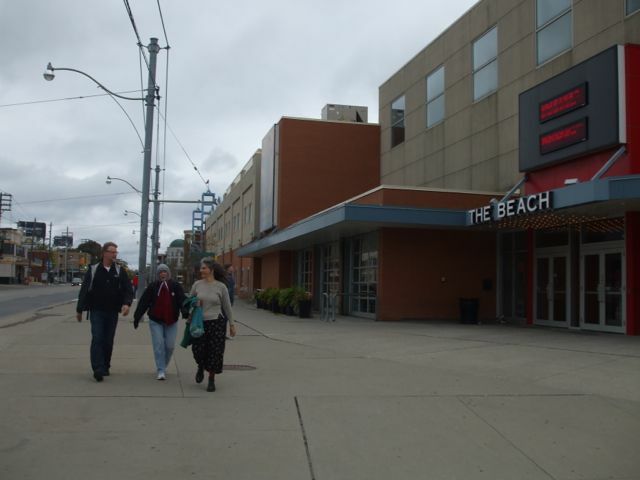 Another pedestrian desert at the Alliance Theatre (Beach) just west of Eastern Ave. that could easily be improved with some seating–who doesn’t need somewhere to wait when meeting friends for a movie? 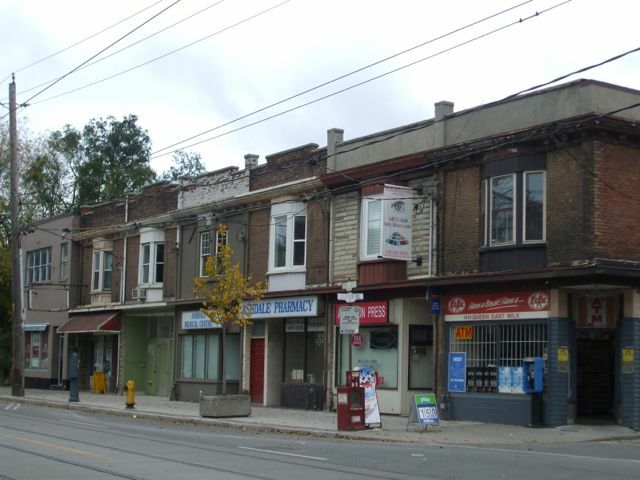 The northern side of the street at Queen and Craven shows a very different view–the old main street shops. 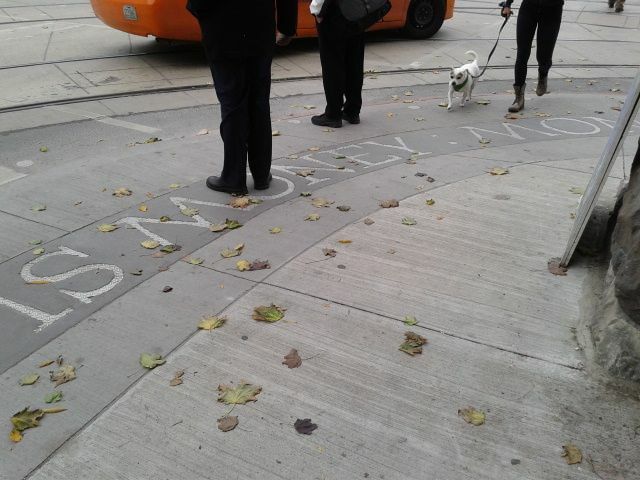 Again, note how little space there is for pedestrians, especially when signage and street trees are added. Ashbridge Estate, the remains of Sarah Ashbridge’s plot of farmland that stretched south to the lake. Ashbridge’s Bay and Ashland were named after her. 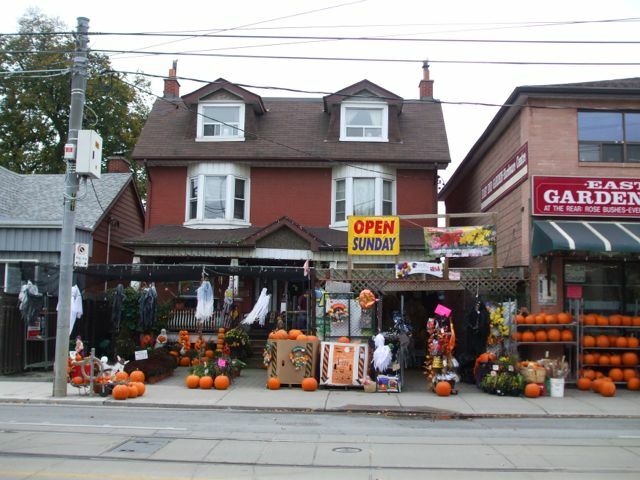 East End Garden and Hardware Centre spills out onto the south side of the street with its Halloween display, taking advantage of its private space. 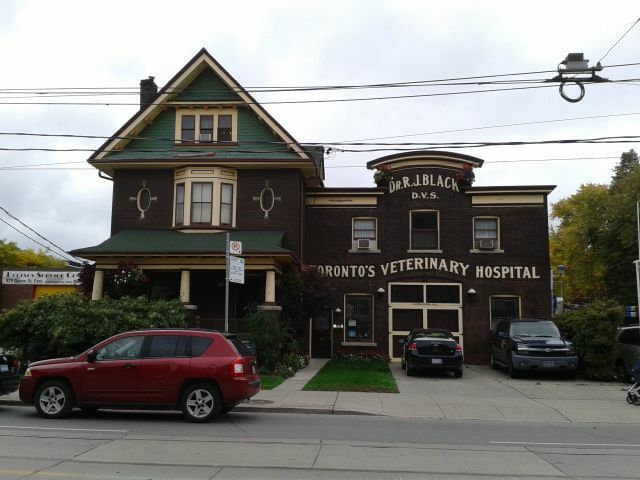 Black’s Toronto Veterinary Hospital (opened in 1911), just west of Carlaw, gives us a glimpse of how buildings used to meet up with the old main street: with a sidewalk, lawn, and garden. 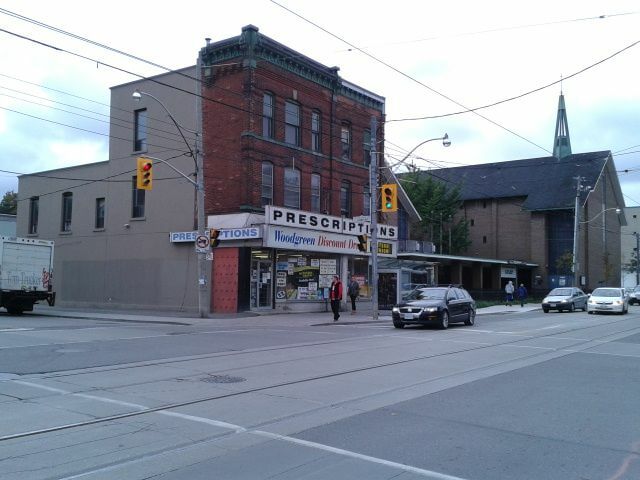 Queen and Coxwell has vestiges of the past in the Woodgreen Pharmacy, but the pedestrian realm is barren here. Note the brick only faces Queen Street, obviously the higher impact was needed on this street over Coxwell. 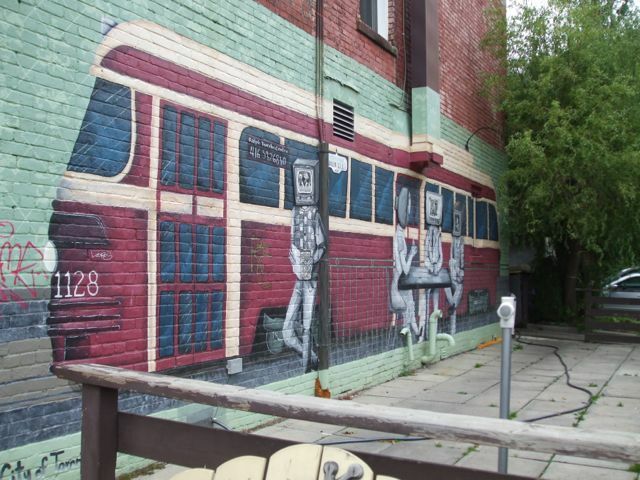 Slices of Canadiana–Canada Dry, immigration/citizenship, and the streetcar. 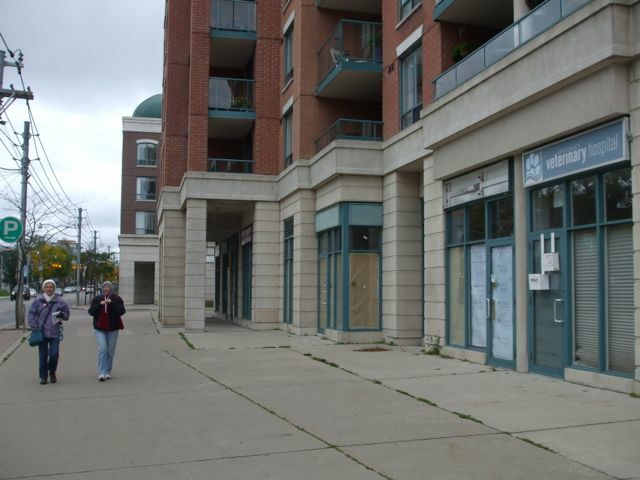 In the Leslieville area now, the sidewalk is far too narrow for the amount of foot traffic the newer shops and services attract. 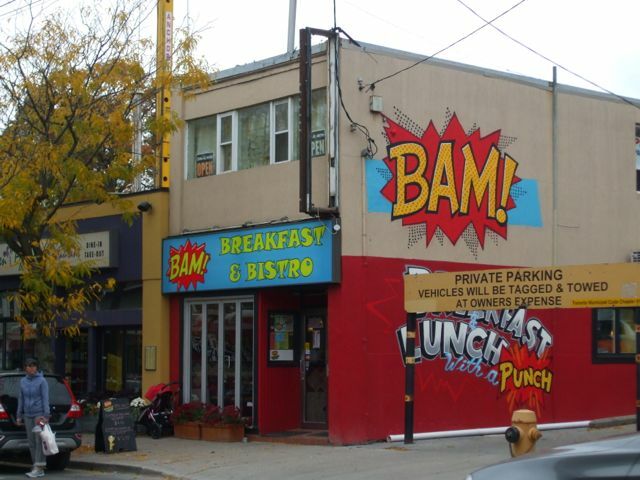 Queen and Broadview, until recently home to Jilly’s adult entertainment and a residential hotel with long-time residents. 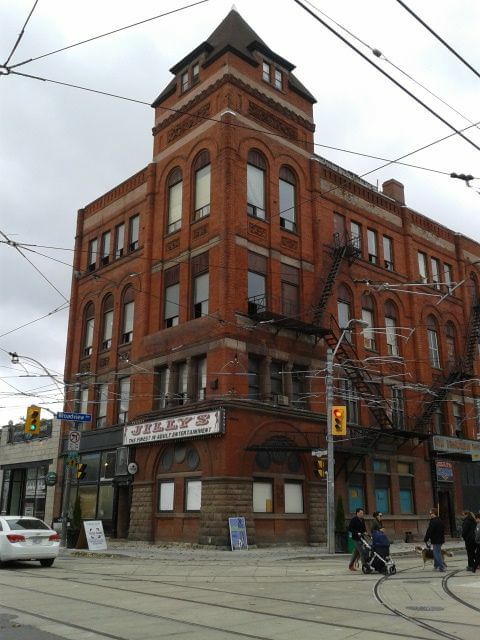 The New Broadview Hotel, which dates back to 1893, is currently undergoing a major redevelopment through Streetcar Developments. 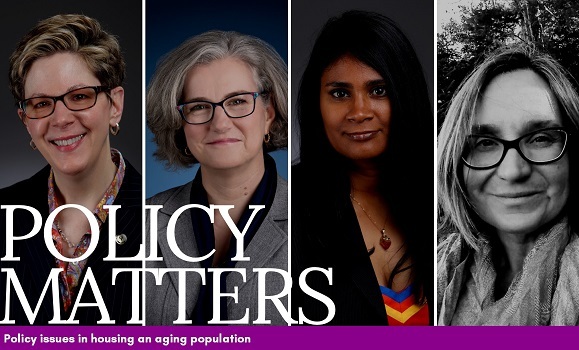 It’s the kind of project that could change the character of this intersection for decades in the future. Aaron Knight of Streetcar Developments tells us about the redevelopment opportunities for the space currently devoted to a car dealership (south side of Queen at Munro). The redevelopment project Riverside Square will see the space as an extension of the public realm.